Cross-account deployment: A single pipeline must deploy a microservice into multiple accounts; for example, a microservice must be deployed to environments such as DEV, QA, and PROD, all in separate accounts. Cross-account lookup: During deployment, a resource deployed into one AWS account may need to refer to a resource deployed in another AWS account. Cross-account communication: Microservices executing in one AWS account may need to communicate with microservices executing in another AWS account. In this post, I look at ways to address these challenges using a sample application composed of a web application supported by two serverless microservices. The microservices are owned by different product teams and deployed into different accounts using AWS CodePipeline, AWS CloudFormation, and the Serverless Application Model (SAM). At runtime, the microservices communicate using an event-driven architecture that requires asynchronous, cross-account communication via an Amazon Simple Notification Service (Amazon SNS) topic. A Booking microservice, owned by the Booking account. An Airmiles microservice, owned by the Airmiles account. A web application that uses the services exposed by both microservices, owned by the Web Channel account. The Booking microservice creates flight bookings and publishes booking events to an SNS topic. The Airmiles microservice consumes booking events from the SNS topic and uses the booking event to calculate the airmiles associated with the flight booking. It also supports querying airmiles for a specific flight booking. The web application allows an end user to make flight bookings, view flights bookings, and view the airmiles associated with a flight booking. In the sample application, the Booking and Airmiles microservices are implemented using AWS Lambda. Together with Amazon API Gateway, Amazon DynamoDB, and SNS, the sample application is completely serverless. The typical booking flow would be triggered by an end user making a flight booking using the web application, which invokes the Booking microservice via its REST API. The Booking microservice persists the flight booking and publishes the booking event to an SNS topic to enable sharing of the booking with other interested consumers. In this sample application, the Airmiles microservice subscribes to the SNS topic and consumes the booking event, using the booking information to calculate the airmiles. In line with microservices best practices, both the Booking and Airmiles microservices store their information in their own DynamoDB tables, and expose an API (via API Gateway) that is used by the web application. Before you delve into the details of the sample application, get the source code and deploy it. Tools: A central location for the continuous delivery/deployment services such as CodePipeline and AWS CodeBuild. To reduce the number of accounts required by the sample application, also deploy the AWS CodeCommit repositories here, though typically they may belong in a separate Dev account. Booking: Account for the Booking microservice. Airmiles: Account for the Airmiles microservice. Without consolidation, the sample application may require up to 10 accounts: one for Tools, and three accounts each for Booking, Airmiles and Web Application (to support the DEV, QA, and PROD environments). Clone this repository. It contains the AWS CloudFormation templates to use in this walkthrough. Install the AWS CLI. To prepare your access keys or a role to make calls to AWS, configure the AWS CLI settings. Follow the instructions in the repository README to build the CodePipeline pipelines and deploy the microservices and web application. Though the Booking pipeline executes in the Tools account, it deploys the Booking Lambda functions into the Booking account. In the sample application code repository, open the ToolsAcct/code-pipeline.yaml CloudFormation template. Under Actions.RoleArn, find the service role assumed by CodePipeline to execute this pipeline stage in the Booking account. The role referred to by the parameter NonProdCodePipelineActionServiceRole allows access to the CodePipeline artifacts in the S3 bucket in the Tools account, and also access to the AWS KMS key needed to encrypt/decrypt the artifacts. Under Actions.Configuration.RoleArn, find the service role assumed by CloudFormation when it carries out the CHANGE_SET_REPLACE action in the Booking account. These roles are created in the CloudFormation template NonProdAccount/toolsacct-codepipeline-cloudformation-deployer.yaml. Asynchronous communication is a fairly common pattern in microservices architectures. A publishing microservice publishes an event that consumers may be interested in, without any concern for who those consumers may be. In the case of the sample application, the publisher is the Booking microservice, publishing a flight booking event onto an SNS topic that exists in the Booking account. The consumer is the Airmiles microservice in the Airmiles account. To enable the two microservices to communicate, the Airmiles microservice must look up the ARN of the Booking SNS topic at deployment time in order to set up a subscription to it. To enable CloudFormation templates to be reused, you are not hardcoding resource names in the templates. Because you allow CloudFormation to generate a resource name for the Booking SNS topic, the Airmiles microservice CloudFormation template must look up the SNS topic name at stack creation time. It’s not possible to use cross-stack references, as these can’t be used across different accounts. However, you can use a CloudFormation custom resource to achieve the same outcome. This is discussed in the next section. Using a custom resource to look up stack exports in another stack does not create a dependency between the two stacks, unlike cross-stack references. A stack dependency would prevent one stack being deleted if another stack depended upon it. For more information, see Fn::ImportValue. The sample application uses a Lambda function as a custom resource. This approach is discussed in AWS Lambda-backed Custom Resources. A calling CloudFormation stack uses the custom resource. The custom resource assumes a role in another account. The custom resource obtains the stack exports from all stacks in the other account. The custom resource returns the stack exports to the calling CloudFormation stack. The custom resource handles all the event types sent by the calling CloudFormation stack. The custom Lambda function is deployed using SAM, as are the Lambda functions for the Booking and Airmiles microservices. See the CustomLookupExports resource in Custom/custom-lookup-exports.yml. The CustomLookupExports resource in Custom/custom-lookup-exports.yml executes using the CustomLookupLambdaRole IAM role. This role allows the custom Lambda function to assume a cross account role that is created along with the other cross account roles in the NonProdAccount/toolsacct-codepipeline-cloudformation-deployer.yml. See the resource CustomCrossAccountServiceRole. The Airmiles microservice is created by the Airmiles CloudFormation template Airmiles/sam-airmile.yml, a SAM template that uses the custom Lambda resource to look up the ARN of the Booking SNS topic. The custom resource is specified by the CUSTOMLOOKUP resource, and the PostAirmileFunction resource uses the custom resource to look up the ARN of the SNS topic and create a subscription to it. Because the Airmiles Lambda function is going to subscribe to an SNS topic in another account, it must grant the SNS topic in the Booking account permissions to invoke the Airmiles Lambda function in the Airmiles account whenever a new event is published. Permissions are granted by the LambdaResourcePolicy resource. When the Lambda custom resource is invoked by the Airmiles CloudFormation template, it must assume a role in the Booking account (see Step 2) in order to query the stack exports in that account. This can be seen in Custom/custom-lookup-exports.py, where the AWS Simple Token Service (AWS STS) is used to obtain a temporary access key to allow access to resources in the account referred to by the environment variable: ‘CUSTOM_CROSS_ACCOUNT_ROLE_ARN’. This environment variable is defined in the Custom/custom-lookup-exports.yml CloudFormation template, and refers to the role created in Step 2. The function get_exports() in Custom/custom-lookup-exports.py uses the AWS SDK to list all the stack exports in the Booking account. The calling CloudFormation template, Airmiles/sam-airmile.yml, uses the custom resource to look up a stack export with the name of booking-lambda-BookingTopicArn. This is exported by the CloudFormation template Booking/sam-booking.yml. Custom resources used in a stack are called whenever the stack is created, updated, or deleted. They must therefore handle CREATE, UPDATE, and DELETE stack events. If your custom resource fails to send a SUCCESS or FAILED notification for each of these stack events, your stack may become stuck in a state such as CREATE_IN_PROGRESS or UPDATE_ROLLBACK_IN_PROGRESS. To handle this cleanly, use the crhelper custom resource helper. This strongly encourages you to handle the CREATE, UPDATE, and DELETE CloudFormation stack events. The SNS topic is specified as a resource in the Booking/sam-booking.yml CloudFormation template. To allow an event published to this topic to trigger the Airmiles Lambda function, permissions must be granted on both the Booking SNS topic and the Airmiles Lambda function. This is discussed in the next section. The Airmiles microservice is created by the Airmiles/sam-airmile.yml CloudFormation template. The template uses SAM to specify the Lambda functions together with their associated API Gateway configurations. SAM hides much of the complexity of deploying Lambda functions from you. For instance, by adding an ‘Events’ resource to the PostAirmileFunction in the CloudFormation template, the Airmiles Lambda function is triggered by an event published to the Booking SNS topic. SAM creates the SNS subscription, as well as the permissions necessary for the SNS subscription to trigger the Lambda function. However, the Lambda permissions generated automatically by SAM are not sufficient for cross-account SNS subscription, which means you must specify an additional Lambda permissions resource in the CloudFormation template. LambdaResourcePolicy, in the following snippet, specifies that the Booking SNS topic is allowed to invoke the Lambda function PostAirmileFunction in the Airmiles account. 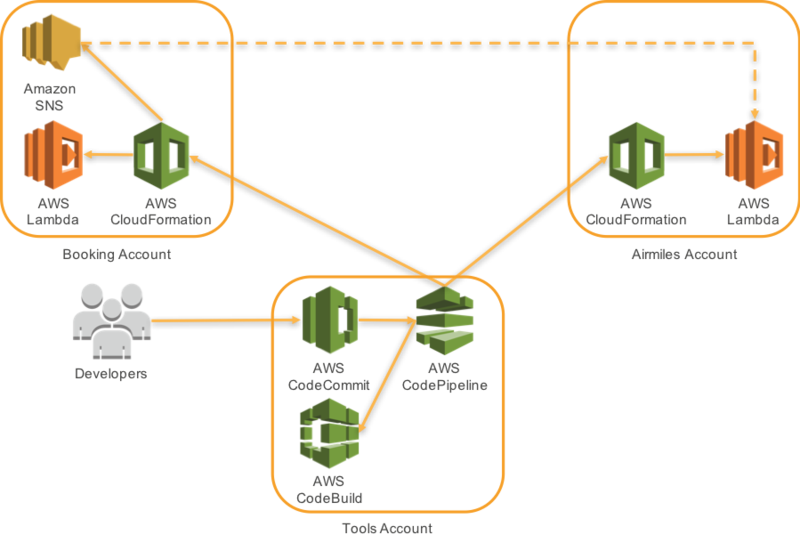 In this post, I showed you how product teams can use CodePipeline to deploy microservices into different AWS accounts and different environments such as DEV, QA, and PROD. I also showed how, at runtime, microservices in different accounts can communicate securely with each other using an asynchronous, event-driven architecture. This allows product teams to maintain their own AWS accounts for billing and security purposes, while still supporting communication with microservices in other accounts owned by other product teams.